From Hagmann and Hagmann last night. If you care enough to want to see judicial activism destroyed! AMERICA, HUMBLE YOURSELVES AND PRAY AND TURN FROM YOUR WICKED WAYS. HE IS COMING! WE AREN’T THE BIGOTS…THE MILITANT HOMOSEXUAL 5%ERS ARE. Just ask Devvy Kidd in her outrage. Liberals always love spreading their misery and dysfunction around. Lowering the bar of happiness for others raises them relatively. She quips that the existence of marriage causes “her brain some trouble.” It is quite evident in her subsequent comments that her brain is very troubled, and by more than just the existence of marriage. And here is what this New World Order neophyte said via video. Oh, and if you think ANY cable news channel will air this, including Faux News…THINK AGAIN! TIME TO TAKE THE RED PILL! MEMO TO HOLLYWOOD…STOP BELIEVING THESE NAZI LIES…OR ELSE! Could action finally be taken against Dannel Malloy and the democrats? The Hartford Courant is reporting Connecticut’s Elections Enforcement Commission decided Thursday to take legal action against the state Democratic Party over its refusal to answer a May 29 subpoena for papers and other material related to the 2014 re-election campaign of Gov. Dannel P. Malloy. The subpoena was served as part of the commission’s investigation of a complaint filed late last year by then-state GOP Chairman Jerry Labriola Jr. The complaint claimed Democrats illegally circumvented the state’s ban on contractor contributions last year by collecting state contractors’ money in a “federal account” and using it to pay for Malloy propaganda in the form of mass mailings. Since the time of the report, CT’s Republican party has chosen Derby’s J R Romano to lead them. The draft opinion would have been bad news for the Democrats. Among its findings were that the mailings appeared to be part of an attempt to “avoid” and “bypass” Connecticut’s clean election laws. Of course the left-wing of CT calls this politics…typical! WELCOME TO CORRUPTICUT! Well, as the event known as the San Diego Comic Convention or Comic Con as it’s called approaches, Melissa Benoist is making the rounds before her appearance at the event representing Supergirl. 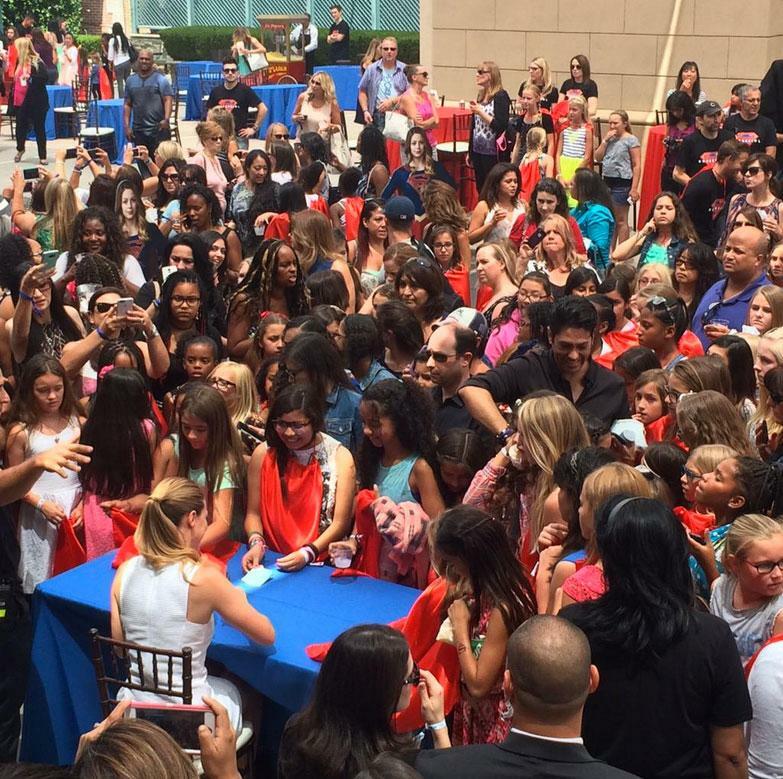 From her Twitter account and those of others she made an appearance today at some event in Southern California signing autographs, And from this picture below, it was packed. Benoist was also there to offer up a screening of the pilot of the show, which had been the subject of some controversy…was it leaked or was it a bold CBS move? A world Premiere only Warners could do! CBS will showcase its brand-new multi-faceted “CBS Mobile Screening Room” from Thursday, July 9 through Saturday, July 11 at Comic-Con® 2015. This 12-passenger pedi-cab, which will provide free rides throughout the Gaslamp district, features oversized monitors displaying rotating trailers and signage from select CBS programs to passengers and pedestrians alike. Network ambassadors, both on and around the on-the-go “screening room,” will distribute several fun Network giveaways. An artist named 5Red at Deviant Art has done here his take on those “Keep Calm…posters. Lastly comes a story from the online magazine Movie Pilot which lists Melissa Benoist as a Star to Watch. With a sense of sunny optimism and a healthy dose of charisma, Melissa Benoist burst onto the scene only a few years ago and began her steady ascent into the spotlight. Her talent and drive were unmistakable when she blew away Ryan Murphy and landed the coveted role of Marley Rose on Glee. While cutting her teeth on her first big part (and quickly getting promoted to series regular), Benoist showed off incredible singing chops and impeccable delivery. 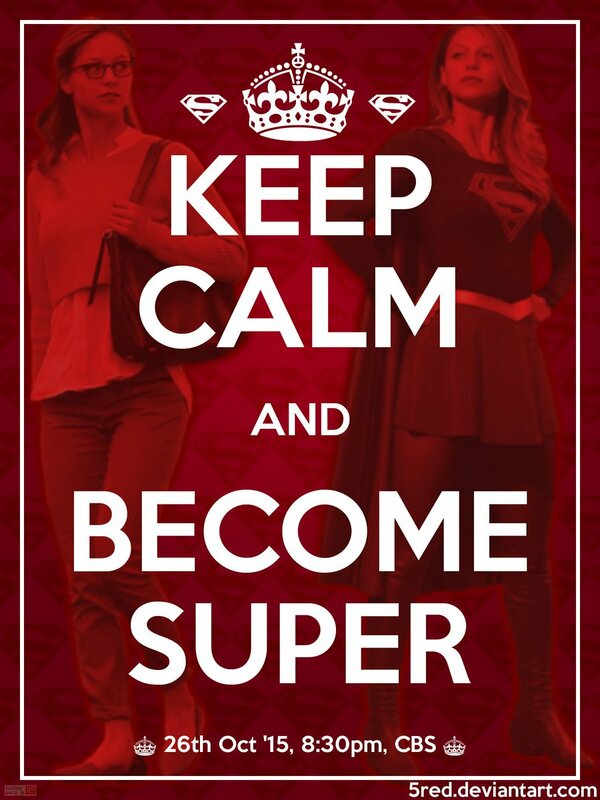 As Kara Zor-El, more commonly known as Supergirl, the young actress will have the chance to embody an iconic character and headline a major primetime series. If the critical success and fan response of The Flash and Arrow are any indicator, this is nothing short of a golden opportunity for the spunky Benoist to show off her power of infectious charm and become a role model for girls everywhere. She may be a relatively new face on our screens, but Melissa Benoist is already commanding attention with her captivating presence and downright likable attitude. She adds an effervescent energy to every role she takes, and that appeal is only bolstered by impeccable comedic timing. And as you are about to see from this interview in 2013 on The Late Late Show with Craig Ferguson, the writing is no idle boast.